For a long time now I’ve been contemplating what would for me be quite a big decision, that of cutting the cord on cable. I thought about doing this last year when I noticed that my TV package costs seemed to be rising at a much steeper rate than the rate of inflation and the rises just seemed to keep on coming. I’ve also had a rolling credit running on my account for the past 12 months which was making my package much, much cheaper and this is also due to come to an end this month, so now was the time to decide what I wanted to do. Firstly, let me explain what cutting the cord would involve for me personally as I live in the UK, so it may be a little different to what other US bloggers have done, simply because there aren’t as many options available here in the UK right now, though this is slowly improving. It’s still a more than viable option to cut the cord in the UK but it certainly seems to be a lot easier to do it in the US. There are two main things that I am going to be looking to get rid of if I do decide to take the jump and cut the cord! The first service I will be looking to cut will be my home phone line. I have to say that just recently, having a home phone line has become more of a curse than a blessing. Most of the people who know me well tend to ring me on my mobile phone if they want to get hold of me, which means that 9 times out of 10 when I answer the home phone it’s a cold caller, a PPI reclaim guy or some other person who I have never spoken to in my life before. It’s REALLY annoying! The only reason I’ve kept hold of my home phone line for so long now is because whenever I’ve looked into it in the past, it hasn’t worked out much cheaper to get rid of it because I still wanted to keep my TV package, and it was just an anomaly that bigger discounts tended to be applied when you were taking a full package of services from a company rather than a single service. Which leads me onto the second thing I’ve decided I can live without, the TV. I’ve always been a little frightened of giving up the TV completely, as I’m a little sport mad and when the big events come on I do like to try and watch them. Nowadays though, with all of the online TV services and apps that are becoming available allowing you to watch catch-up or even live TV online, I really think I will be able to survive now with just a decent broadband and WIFI package. I know that if I still want to stream live TV then I’ll have to keep my TV license going which is fine with me, but I just don’t feel like I need – or even have time for – hundreds of television channels anymore. I don’t know about you but I find that if you allow it to, the TV can become a massive time drain which stops productivity and ruins quality time with the family, so I have no problem getting rid of excess channels. If like me you are thinking about cutting the cord on cable because your TV, Phone and Broadband package is coming up for renewal then I would definitely look at some of the deals TopCashBack have to offer when deciding whether to switch your broadband provider or not. I have now switched because I’m cutting the cord and I got over £100 in cashback plus a much better deal on my broadband which will save me money every month too! By getting rid of my home phone line and my TV package and surviving on streaming any TV programs that I really want to watch through either my Smart TV or my Fire TV Stick and making full use of my Amazon Prime package, I’ll be able to more than half my monthly entertainment package bill and this will give me more money to save and invest each month. Hopefully I’ll find that my productivity will improve as I won’t waste as much time watching programs that I’m really not all that bothered about, which will also free up more time for activities with the kids too. I don’t just view cutting the cord as a financial gain but I also think that it will be a life gain. I suppose it’s what you might call a win-win. 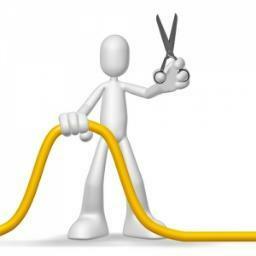 Have you thought about cutting the cord or have you already done it? Don’t Forget, Free Sky Sports This Weekend! Congrats on making the leap to a cable free existence! I cut the cord years ago without a regret. Granted, being in the US, I do have a lot of content to choose from. And Netflix did not disappoint. If you’re concerned about lack of content in the UK, you might consider a VPN. Most of them will let you send your traffic to another country in order to bypass geoblocking. So for $50 a year you could access all the Netflix or Hulu content available in the US.